We're in the Lean Forward connected age. Leaning back and watching tv is so yesterday. There's been a lot of talk about engagement via mobile in the advertising and marketing circles, but the overwhelming agreement is that mobile has emerged worldwide as the new 'first' screen – or the device of primary engagement. There's a study that's bee done for the US market by Millard Brown that shows mobile emerging as the clear new first screen (no pun intended). The study reveals that Americans now spend 150+ minutes per day on smartphones, next to 147 in front of TVs. But the numbers are even greater elsewhere. In China, consumers spend a whopping 178 minutes a day buried in smartphones, nearly double their TV watching time. 80 percent of social media time is now on mobile, and the numbers of video consumption on mobile is up 100 percent (50%+ of YouTube views are on mobile according to Google ), it's time your brand got mobile marketing right. Today, your best marketing efforts (and the best results you may get) should be from mobile. AdAge magazine tells us "According to findings, the smartphone has emerged as the primary screen worldwide, but the firm also found users are watching multiple screens simultaneously, a global trend that is most-pronounced in China. "It's still a recent phenomenon that people are tethered to their phones while watching TV," said Joline McGoldrick, research director at Millward Brown. "Their default is to type something into their smartphone." As in any form of marketing – Customer Insights should be your first step. Use data and analytics to understand how your target audiences are using mobile – which is basic insight. Are they transacting or using it to gather information? Are they simply consuming or engaging? Are they mostly on Android or iOS; smartphones or tablets? Are they second-screening (see intro above)? If, so, how? Millard Brown classifies simultaneous screen time (second screening) into two key buckets: "stacking," when the consumed content is unrelated (mindlessly surfacing Facebook during a favorite show); and "meshing," when the content synchs up (searching for an actress in the show). Based on the insights you have you will know best what your audience expects from a mobile app, and you'll be able to make the next few decisions easily...? You don't need to rush and build a mobile app just because every one seems to be doing it. In most cases a mobile-ready site ("responsive" is ideal) will meet most requirements. Mobile apps in general, allow for more creativity, and better interaction with your target audience. Once you know, how your target audience or your customers use mobile to interact with your brand or any brand, you can decide whether you need a mobile-ready website, an app, or both. So start with point one: Insight. 3. Intent is key. What do your target audiences or customers want? Demographic targeting is giving way quickly to intent driven targeting and 'in-the-moment' marketing. Google tells us that marketers who rely on demographics to reach consumers may risk missing more than 70% of mobile shoppers. With the huge increase in mobile consumption, we're now discovering the power of consumer intent as it happens, moment by moment. Read more here about Intent Driven targeting and the four micro moments on mobile. 4. You know your audience. What's the competition doing? Check out your closest competition. What are they doing on mobile? What's the industry trend for your brand? Get a hold of your competitor’s apps. This will give you an idea of what's working for them, and what's not. Competitive analysis is a great insight point. 5. If developing an App – get App Store Optimisation done. No point developing an app for your brand or product when it disappears down the App Store list. You really need to have a solid ASO strategy to stay close to pole position. Just last week, Twitter did this brilliantly, listing itself as News App rather than a social platform to head right to the top of the list, rather than competing with Facebook and Instagram. Understanding and implementing ASO is a critical part of heading the lists in the App Store. Sites like apptamin.com offer great information on the subject. Once you are there with the App, what's your strategy then to ensure that you motivate your target audience or customers to download the app – and retain it on their devices. There's a cost to that. Keep that in mind. You must know the most popular apps that have high visibility and engagement – which allow for in-app ads. Advertising on Twitter, for example is a great way to boost your mobile app or your optimized website. • On mobile, the average viewing session is now more than 40 minutes, up more than 50% y/y. 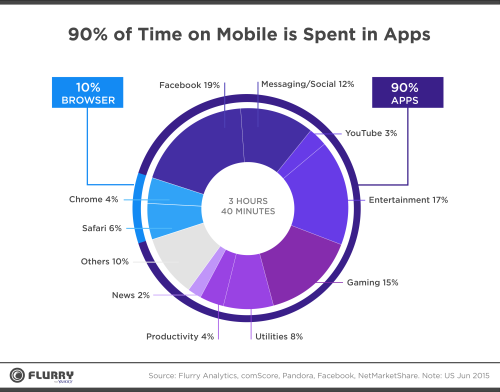 • The number of hours people spent watching videos on mobile is up 100% y/y. • More than half of YouTube views come from mobile devices. Carefully plan your social media strategy to gain traction for your mobile presence. Social media platforms offer the quickest way to engage via mobile and in particular to bring that app you develop to the forefront. Mobile is is a personal device – and social is a hugely personal activity. Time spent on social on mobile has surpassed time spent on desktop social, and for some parts of the world, mobile devices are the first and only computer people possess. 8. Mobile is in Real Time and Local. Use that advantage. Build your mobile brand experience to be in real time and be local context sensitive. Location is a big area for brands on mobile. Beyond LBS (location based services) consider iBeacons and geo-fencing when targeting your audience. You'll be able to target your audience based on where they’ve been in the past, where they live, work, hang out and where they are at the moment. The trick is in being there when that someone in your audience is looking for a solution that your business can provide. These are the essentials in our mobile-centric times. There are other factors as well, like highlighted in the linked post below. 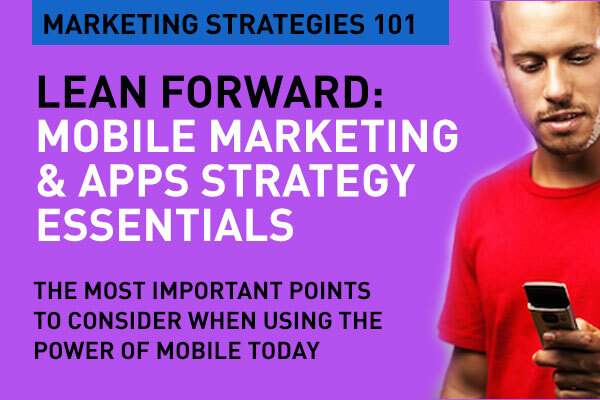 If you're not on the mobile marketing stretch yet, you are way, way behind in the race. If you're already doing it, keep the basics in mind. 1. Think customer-first before you think mobile-first. 5. Mobile has to be personal and local. Mobile penetration in this region is high, and so is smart phone adaption. Mobile is everywhere – and we need to be aware is mobile today is not just about the handset. Tablets, wearable devices, connected cars, are all mobile. Brands today are creating apps, doing ad campaigns, focusing on mobile search and jumping on to the mobile-first bandwagon without a blink. Getting the basics right is key. That's part of your Digital Marketing Strategies 101. With mobile penetration so high in the region, how can some companies not be in mobile marketing? This is a good guide for every one who wants to start mobile marketing. Why not mention Snapchat as a huge influence on social media using mobile. Snapchat gets 10 billion views a day. And also, you did not mention the possibility of paid mobile advertising at all. Regarding the mobile strategy, you did a good job in outlining the basic steps. Very useful to read about: second screening) into two key buckets: "stacking," when the consumed content is unrelated (mindlessly surfacing Facebook during a favorite show); and "meshing," when the content synchs up (searching for an actress in the show). Today the customer is in a Lean forward mode as said here, because he or she is in control. People do not trust brands and their advertising. User content - reviews, shares, comments are far more important as a trust factor. Even with customer service, the customer can demand the most out of companies and highlight their failures easily on social media. Mobile makes this very quick. People stand in supermarkets and complain on their mobiles. They do the same with bad service on a airline flight that is late. Mobile has become a power tool for the user today to have control on what the company does and how it serves them. Measurement is the cornerstone of all marketing activities – and with mobile marketing this is crucial that marketing managers measure their ROI on mobile. That should be part of their strategy. Salesforce is such a successful company in our market (here in the US) because they deliver on their promise of Mobile features connect you with your on-the-go customers through any channel. Salesforce allows us to use real-time interactions with push notifications, SMS and MMS messaging, and other helpful tools to reach customers — wherever they are, whenever. Marketing of mobile applications is just as important as its development. Unlikely that you'll do it yourself without having any experience. In this case the best solution would be to cooperate with a proven service which is engaged in the promotion of mobile applications. The above strategies are very interesting way to improve App store optimization in App store.